Snap-fit cap prevents the extra-durable tip from drying out when not in use. Note: A minimum quantity of 20 must be ordered, and in units of 1 thereafter. 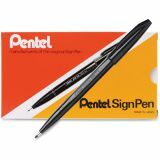 Pentel Arts Sign Pen Color Marker, Extra-Fine Bullet Tip, Black, Dozen - Fiber-tipped sign pen offers a durable porous tip that is excellent for general writing, drawing, doodling and adding character to any signature. Radiant, water-based ink is perfect for anytime you put ink to paper. 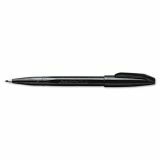 It is ideal for use in the home or studio by artists, designers and anyone who enjoys writing or drawing. Snap-fit cap prevents the firm, durable tip from drying out when not in use. 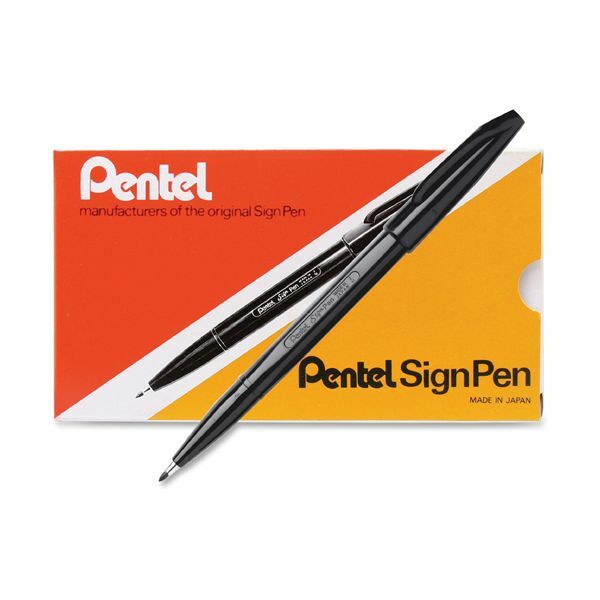 Nonrefillable Sign Pens are certified AP nontoxic by ACMI.